Marlowe Christie, an ex-Hunter and the final boss of the game's first adventure, Wilshire Village. The persistent nature of the game–how do the characters develop and how does the story progress across multiple sessions? The bosses–how can we pack the maximum number of interesting bosses into the game and still make them easily parsable? Integration–how do we bring together the paragraph adventure book, the vertical arena board, the monster's actions, and the hunter's actions into a cohesive game experience? With progress being made weekly on all three fronts, I'd like to show you where we are now. With Seventh Cross, after a lot of pondering, we decided to try a different campaign model than what we had seen in other games of this type. Players gradually build decks, gain new powers, acquire new allies, and fight powerful monsters. This progression is one of the most fun parts of the game–getting these new abilities and integrating them into your fighting style is one of the most enjoyable parts of any RPG-like experience, and we wanted to make sure players would have a strong progression curve as they explored. There should be no game where you don't make significant advances toward your character's next power tier. Rather than making a slow burn where the progression would be stretched out across a campaign spanning many castles, we decided to tighten up the scope of a campaign. Now, each castle is its own campaign. Hunters begin a castle with just a few resources at their disposal, and quickly acquire new skills and powers, recruit new allies, and unravel the story. The fast pace of this advancement means that each adventure can end with a truly climactic final boss battle, with fully realized heroes taking on a worthy foe. A rough look at the map board, where the players will choose their destinations between battles. The large numbers represent boss stages, while smaller numbers are exploration stages where you might discover new allies or keys to the story. After the castle is complete, that particular 'campaign' is over, and the characters are reset. Discoveries that the characters make and plots that they resolve will increase the quality of items and skills that show up in the discovery decks (things hunters can find during the next campaign). The hunters themselves, however, begin the next castle back at their starting levels. This iterative exploration style provides a few other advantages beyond just the growth curve we have in mind. It allows players to jump in and out of future campaigns and still experience a 'full story', due to the closed nature of the narrative. It also allows better replay options, since different story paths can unlock new discoverable items. You may find yourself replaying a castle multiple times to try and find the different endings and hidden bosses. We knew from the start that we wanted Seventh Cross to have a lot of bosses available to fight. That richness of content is a hallmark of Level 99 Games, and bringing it to life in this project is something we've been working hard to accomplish. At least half of the strategy in a good monster-hunting game is understanding, controlling, and mitigating the damage that the monsters can do to you. Like in our inspirational materials (Bloodborne, Dark Souls), hunters balance on the edge of a razor, where any slip could spell death at the hands of creatures far larger and more powerful than yourselves. With unlimited time to consider their decisions and responses, finding the right balance of revealed and hidden information has been a challenge. At the same time, we have to make monsters' routines fairly clean-cut so that human players can control them without interrupting the action too much. We tried a number of systems that were card-based, and ultimately decided that generic cards didn't create enough personality for the monsters, while unique cards for each of our 60+ planned boss encounters would bloat the game beyond reason. We finally settled on a book-based monster system, where each enemy utilizes a control grid to make their moves. The monster's behaviors are detailed in the bottom left area of the page. Colors determine attack types, while letters determine the variant of each attack that is used. Colors are selected in a fixed pattern, but the letters continue changing throughout the fight. Players can learn the monster's attack pattern (colors), which is randomized the first time through their routine, but remains the same on subsequent laps. However, each color has variations, and the order that the monster uses these variants will change on each loop through the monster's behavior. Each monster also has an Instinct effect they use when their attacks fail, and a finisher effect they use when their attack rotation ends. These two effects keep the players under escalating pressure. The book also makes it possible to speculate about where the monster is about to strike, letting more cautious players make informed decisions about where to set up between rounds. While our previously pioneered Monster-Controller system was quite novel, we found that players preferred to be focusing on their own actions, and that this actually detracted a fair bit from the enjoyability of the game. It's a novel mechanic that will perhaps show up somewhere else in the future. We're still working out exact balance for various difficulty levels of monsters, but things are coming along at a good pace. 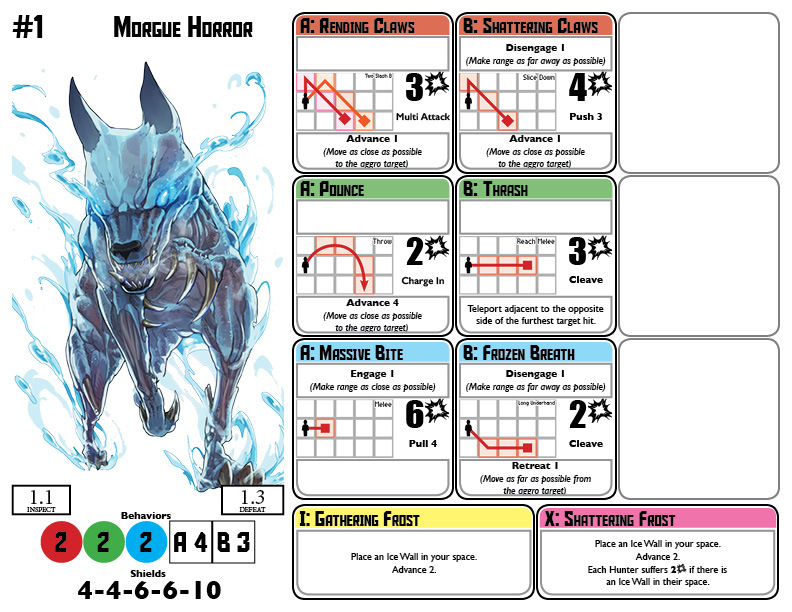 We have run a bunch of successful playtests with the new system, and are planning to get stand-alone monster fights into a public testing Tabletop Simulator Module fairly soon. Figuring out where the adventure book becomes involved with play, how we convey stage setups, and how the game transitions between its various phases are things that we're still working on. One major innovation since our last update was the inclusion of Key Items. These are tools that your party will discover–actual artifacts from the world which can be used to advance the story. The example above is a newspaper clipping the players can discover in Wilshire Village. It can be shown to the various associates the players encounter. Each associate will have something different to say about the article, and some may provide extra assistance, clues, or exploration opportunities. We felt that story is often forced upon the players in narrative games, and decided on this system so that we could put the story in the players' hands. They can choose to explore these leads and learn more about the world. Or they can rush in to the next boss fight. Either way, the players are in control of the story, and can explore it as much or as little as they wish. Additionally, there are some Key Items which can be used in combat to alter the outcome of a fight, forking the story in different directions. Now that we have systems stabilized a bit and are getting into the content creation portions of the game's development, I'm a bit more comfortable writing about how things will be in the final game. Next time, I'll write a bit about the skill and hunter-progression systems that we've devised for the game! See you then!